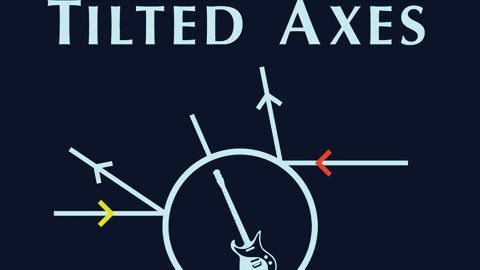 With roots in the classical and theatre world, guitarist Patrick Grant collaborated with Robert Fripp in his Orchestra Of Crafty Guitarists, and his own Tilted Axes project is cut from similar avant-garde cloth. Grant’s just one of around a dozen axe men on Music For Mobile Electric Guitars (Peppergreen Media), which contains several quasi-Crimson moments (squally, hypnotic opener Shapes 1, the surging, subtly oddly-metered Techno Tilt). The approach is post-modern and smacks of experimental theatre, but the music’s excellent and only arty in the most complimentary sense. Would love to see these guys live. Tim Muddiman has played guitar for Gary Numan and Pop Will Eat Itself, and he brings his gauche swagger and attitude to Paradise Runs Deeper (Gunstreet), the new one from Tim Muddiman And The Strange. The sparse guitar riffs and drum machine rhythms of Bullet Stroke and Glass Queen bear comparison with Depeche Mode, and Damage Is Done is a particularly good piece of dark pop songwriting. Imagine Steven Wilson donning a battered biker jacket, greasing back the hair and cutting to the compositional chase; Muddiman may be as close as we’ll get. Touchstone founder Rob Cottingham returns with his new band Cairo, who open their account with debut album Say (available from the band’s website). Stylistically it’s not a million miles from the keysman’s former band, with moments crunchy (Nothing To Prove) , ethereal (the lovely Katrina) and hooky (lead track Say). New singer Rachel Hill bolsters the band leader’s own vocals nicely, and John Mitchell’s assured production makes this a sure-fire proposition for fans of this more staid brand of prog. Savoy Motel look at things through the other end of the telescope. The warped alt rock confection of their self-titled debut (Noisey) is taken to another level by their proggy approach to arrangement. In other hands Souvenir Shop Rock could have been a limp, indie anthem; here the mumbly, multi-layered vocals, fizzing guitar hooks and synthy brass are all the better for the way they’re so thoughtfully laid out. Western Boogie could be the Sugarcubes jamming with 10cc; they surely found International Language down the back of Todd Rundgren’s sofa, and the title of Mindless Blues is only ironic. This Hotel may be too twee for the ‘Genesis-or-nowt’ crowd, but do drop some Optrex in that third eye and make a reservation. Coming on like the last evening breeze of your best-ever summer holiday, Mild High Club’s Skiptracing (Stones Throw) is an utterly irresistible, hazy fantasia on 70s AM radio. Alexander Brettin’s laconic delivery sits atop warbling guitars, woozy tropical extracts and soft jazz cadences that evoke Steely Dan, had they ingested the very finest psilocybin known to humanity. Cary Me Back, Kokopelli and particularly the dreamy Chapel Perilous will ease you on your way to a much, much better place.